Skinstitut understand the importance of beautiful skin. Suffering from any skin condition can cause emotional discomfort, stress and lack of confidence. Seka's Beauty Case @101 Darley Beauty Collective offer a diverse range of treatments for ailments including: acne, pigmentation, sunburn and Melasma treatments. Our fully qualified skin technicians will help attend to everything from itchy skin to high end skin care. Skinstitut products are clinically tested and cosmedical grade skin care products that are excellent for wrinkle and sunburn treatment. Seka's Beauty Case @101 Darley Beauty Collective offers high end skin care products that are rich in vitamin A and C, the essential nutrients required for dry skin treatment. 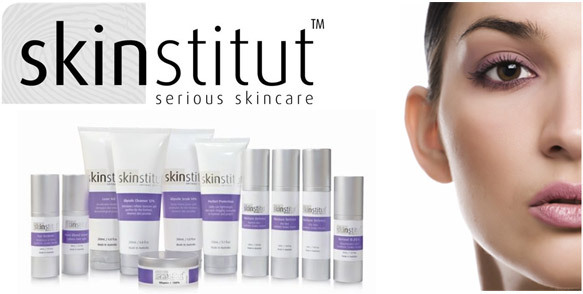 Skinstitut Products have been extremely effective for treating and preventing itchy skin and Melasma. At Seka's Beauty Case @101 Darley Beauty Collective, we offer treatments and solutions for all skin types and conditions. High end skin care treatments used for eradicating acne and pigmentation are becoming increasingly popular due to pollution and other skin irritants in the environment. The beauty and skin experts at Seka's Beauty Case @101 Darley Beauty Collective are qualified to recognise the signs of skin deficiency and will effectively recommend Skinstitut products to eradicate any skin complaints. These products cover sun damage treatment, Melasma treatment, wrinkle treatment and sunburn treatments. To eradicate your skin condition please call (02) 9979 5678 for a professional consultation with one of our friendly experts. Not only will you get an analysis of your skin problem but we will offer an equally effective treatment plan. Coined in the 1930’s, a cosmetic is classed as a skin beautifying product that remains on the surface of the skin. A cosmetic can include cleansers, toners and moisturisers. Unable to create any structural changes within the skin, a cosmetic addresses and maintains present concerns of the skin. Cosmetics account for the bulk of skincare used by consumers and is generally purchased in a supermarket, pharmacy or department store. Cosmetics do not include a high percentage of active ingredients if any and are not generally prescribed by a qualified professional. Cosmeceuticals on the other hand have been around since the early 1980’s and can be defined as the link between a cosmetic and a pharmaceutical. Cosmeceuticals contain active ingredients such as Retinol and AHAs at high active concentrations and have the ability to create a structural change within the skin. Due to the nature and presence of active formulations, cosmeceuticals should be prescribed by a trained and qualified skin professional. Cosmedicals can be described as advanced cosmeceuticals and are regarded as the newest and most sophisticated generation of skin care. Cosmedicals correct not only past and present concerns, but have the ability to provide prevention for the future. They incorporate advancements in encapsulation, nano technology and peptides, as well as contain high grade chirally correct active ingredients, ensuring a more effective and results oriented approach to skin care. Skinstitut Cosmedicals contain proven technology that is clinically tested, with the highest percentage of active ingredients without a prescription and can only be purchased through professional skin clinics and surgeries by a trained and qualified professional. Alpha Hydroxy Acids or AHAs is the family name for a group of naturally occurring acids found both in plant matter and the human body. The primary use of AHAs in cosmeceuticals is as both exfoliators and as hydrators. They are generally used to treat the symptoms of such skin conditions including, photo-damaged, pigmented, aged, dry and breakout prone. The associated benefits and results are dependent on the following three criteria; type; concentration and pH. Of these five choices, Glycolic and Lactic Acid have been proven scientifically to be most effective on the skin, not only because they have the smallest molecular structure of the AHA family, but because of their superior ability to hydrate and normalize the skin. Often used in combination with Glycolic Acid or as a more gentle substitute. Mandelic Acid (traditionally extracted from almonds) is technically classed as an Aromatic Alpha Hydroxy Acid. Possessing a larger molecular structure than Glycolic Acid, Mandelic Acid is renowned not only for its exfoliating and hydrating properties, but also possess intense antibacterial and anti-inflammatory properties unlike its AHA relatives. 2) Concentration: Scientific studies have indicated that AHAs are effective exfoliants only when present in a formulation at a percentage greater than 4 -7%. Whilst lower concentrations may provide some minor hydration, it is clear that the best benefits are attributed to those products containing either Glycolic Acid or Lactic Acid in a concentration between 7-15%. Formulations with anything higher risk sensitizing, flaking or even burning the skin. As with many active ingredients, more is not necessarily better. As AHAs are not oil soluble, their effectiveness is diminished when combined with any animal, vegetable or mineral oil within a formulation. 3) pH (Potential of Hydrogen): pH determines the acidity, neutrality or alkalinity of an element (a single ingredient) or compound (a mixture of ingredients) on a scale of 1 to 14. Water, being pH neutral is classed as a 7, therefore assigning any element or compound between 1- 6.9 as an acid and any between 7.1-14 as an alkaline (scientifically referred to as a base). Commonly known bases include soap, baking soda, heart-burn antacids and pool chlorine, with commonly known acids including fruit juice, rainwater, vinegar and the human skin. Despite common misconception, the pH of the human skin can range between 4.5 up to 6.5 depending on ethnic background, health and diet. Human skin is therefore an acid. Over use of base products such as soap and stripping foaming cleansers can often not only imbalance the skin’s natural acid mantle (or natural pH) but often over-stimulate sebum (oil) production thus leave the skin prone to bacterial invasion. AHAs assist in the re-acidifying of the skin and encouraging natural balance. Another common misconception is that the “tingling” feeling often associated with AHA products is the skin burning. Providing that the AHA formulation is no lower than a pH of 3.8 or the concentration no higher than 20%, the “tingle” in most cases is the skin merely adjusting its own pH – just like the tingle skin often experiences after a gym workout where sweat (or uric acid) is released or on a hot humid day. A simple procedure to confirm pH adjustments and not burning is to look at the skin in a mirror after applying an AHA product - in exceptional cases, if the skin goes bright red as it tingles, it is most probably burning, however if the colour remains the same or develops some very slight pinkness as it tingles – the skin is merely adjusting pH and there should be no concern. Remember when comparing various AHA products available on the market, no matter how high the concentration of AHA is claimed, if the pH of the product is not correctly acid balanced, then the AHAs may have little to no effect. As an exfoliant, both AHAs normalize the Stratum Corneum, by releasing the ionic bonds (glue) that bind dead skin cells (Corneocytes) together. The glycolic dissolves down through the dead cells and starts releasing them in an upward motion. Contrary to many media misconceptions, Glycolic acid at cosmeceutical strength concentrations does not attack live skin cells, it assists in the prevention of abnormal keratinisation (dead skin cell build up) by sloughing away dead skin cells. As exfoliants, clinical studies have indicated that the abilities of Glycolic Acid are superior to those of Lactic Acid. 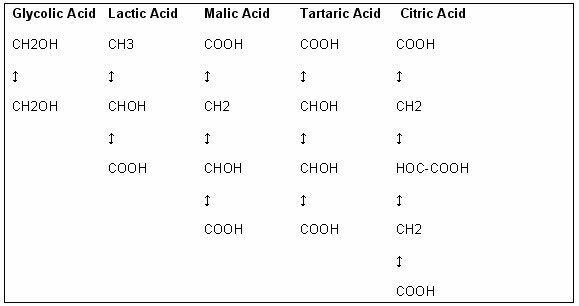 The role of AHAs as hydrators is supported by the fact that Lactic Acid itself is a component of skin’s own Natural Moisture Factor (NMF) in addition to being found in the blood and also in muscle tissue. Studies have indicated that Lactic Acid not increases the water retaining capabilities of the Corneum layer, but has superior humectant properties than traditional hydrators such as Glycerin. AHA’s stimulate the production of sugar derived skin tissue component and natural skin hydrator Glycosaminoglycans (GAG), which in turn stimulates the production of Hyaluronic Acid, (a GAG component reputed to hold its own wait in water over 1000 times). This stimulation of Hyaluronic Acid has been claimed to re-energise the Fibroblast cells, hence increasing the production of collagen and elastin within the Dermis. Water levels are hence increased in the short term and the skin’s own ability to draw and trap water is increased in the long term. Common misconception claims that regular use of AHAs can in fact thin the skin. Considering the increases of hydration, collagen and elastin that both Glycolic and Lactic Acids create, such beliefs are far from the truth. AHA’s in fact can thicken and plump out an aged, dehydrated, environmentally aggressed skin. The normalising capabilities of AHAs go further than the reduction of a thickened Stratum Corneum via exfoliation. Consider the skin of an average 10 year old child and compare it to that of an average 35 year old adult. The child’s skin renews and sheds dead cell build up roughly every 20 days, there are no signs of acne, pigmentation or wrinkles and the skin’s support structure is firm, toned with no imbalance of overproduced sebum. The 35 year olds skin however in contrast demonstrates an inconsistent renewal cycle, often with a turnaround of every 30-35 days, there may be slight acne or breakout on the chin and around the jaw line, with evident sun damage and pigmentation on the cheeks and across the forehead. Crow’s feet have appeared around the eyes, expression lines have created indents on the forehead and the skin appears sagging and sallow with an oily t-zone and dehydrated cheeks. The major difference between the two skins is more than visual; age, sun damage and environmental aggressions have affected and interfered with the normal functions of the 35 year old skin. Scientific studies have indicated that AHAs encourage a more compact and even Stratum Corneum. The skin’s surface appears smoother, softer and radiant. Normalized exfoliation means the skin is renewed at a consistent rate by means of a faster cell turnover. Surface pigmentation can be lifted, wrinkles can be smoothed, blockage of pores can be prevented and the tone can be improved. Normalised Glycosaminoglycan (GAG) production results in a more efficiently hydrated complexion with firmer support structures and lifted contours. AHAs through these mechanisms both individually and combined, unite in creating as normalised function as possible, encouraging mature or damaged skins to behave younger or more efficiently. There are generally two types of wrinkles that become apparent on the skin – those caused by a combination of dehydration and sun / free radical damage and those created from the day to day movements and expressions of the face, via repeated movements of the muscles. These later lines are known as mimic wrinkles. SYN®-AKE has been developed as efficient smoothing and anti-wrinkle care particularly effective against expression lines by relaxing facial muscles. 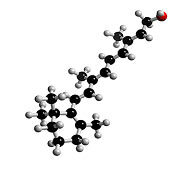 This active tri-peptide acts in a manner similar to Waglerin 1, a neuromuscular blocking compound of the venom of the Temple Viper. 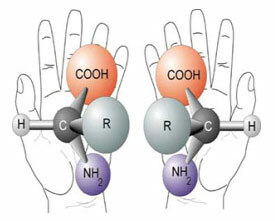 Acting at the post-synaptic membrane, SYN®-AKE is a reversible antagonist of the muscular nicotinic acetylcholine receptor (mnAChR). We assume that the tri-peptide is binding to the epsilon subunit of the mnAChR which prevents binding of acetylcholine to the receptor; consequently it remains closed. In the closed state, there is no uptake of sodium ions (Na+) and the muscles stay relaxed. The study was performed on 45 volunteers. SYN®-AKE has been compared against placebo and against a reference substance. Both products have been used at the recommended use level. 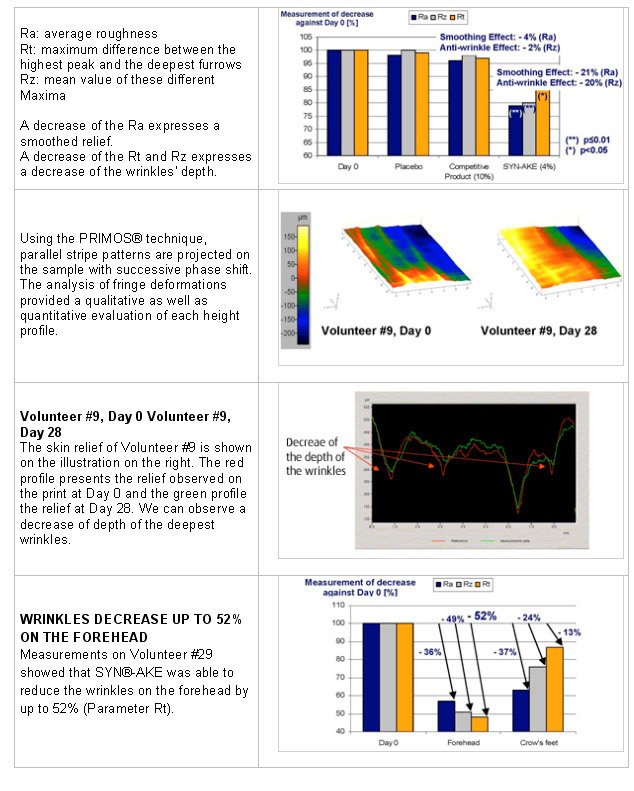 The study lasted 28 days with a twice-daily application. Both products have been used at the recommended use level. SYN®-AKE at 4% and the reference substance acetyl hexapeptide-3 at 10 % (Argirilene). SYN®-AKE clearly showed a higher efficacy for all tested parameters. Often referred to as “the anti-aging vitamin”, Vitamin A has been claimed to visibly reverse the aging process. Found naturally not only in the human body, but also in plant material (such as carrots and pumpkin), this oil soluble, bright yellowy-orange extract is often used in cosmeceutical formulations in the form of Retinoids, or Vitamin A derivatives. Not only guaranteeing a gentler delivery system to the skin, topically applied Retinoids have the ability to be converted by the body back into Retinoic Acid, a form of Vitamin A with the ability to alter collagen synthesis, stimulate the growth of fibroblasts and the extra-cellular matrix. Vitamin A is essential for the generation and function of healthy cells ensuring the prevention of dryness, scaliness and infection. Topical retinoids have powerful therapeutic potential in the management of various skin conditions. Many studies have demonstrated that once-daily topical applications of Retinol improve fine lines and wrinkles, lighten pigmentation, rebuild the stratum corneum, and increase dermal collagen synthesis and assist angiogenesis (formation of blood vessels). Therefore contributing to a smoother, brighter more even complexion. Vitamin A in the forms of Retinol, Retinyl Palmitate, Retinyl Aldehyde and Beta Carotene are likewise used in cosmeceutical formulations to exfoliate, revitalize and firm the skin’s surface and are used to treat a variety of conditions including aging, acne, rosacea and damaged skins. As a metabolic regulator, Vitamin A normalizes the cellular chemical process that produces energy and growth, thus targeting mutations within the skin and attempting to correct the imbalance. Like a mechanic who services a car to ensure smooth running, Vitamin A finds and attempts to fix any running issues. Whilst many studies have indicated that Vitamin A causes birth defects, these studies have only been proven where over the daily recommended intake has been exceeded by over 200%, greater than 10,000IU of ingested Vitamin A. 1% of topically applied Vitamin A however is equal to about 578IU, some 2.3% of the RDI of ingested Vitamin A. It is recommended that concerned pregnant consumers seek permission from their doctor. There are however no studies to indicate that pro-Vitamin A derivative Beta Carotene, Retinol and is derivatives have any effect on pregnancy. Vitamin A however is a known photo-sensitiser and sun screen must always be worn during daytime use. Vitamin A is sun-sensitive and its effectiveness will be diminished due to UV exposure, the use of a sun screen will also protect its efficiency. Unencapsulated Vitamin A, present in a formulation over 0.5% can cause burning, peeling and sensitivity, often leading clients to discontinue use of their product thus, forfeiting results. It is for this reason Skinstitut utilises Encapsulation technology, which is a type of delivery system designed to release the active Vitamin A within the skin (rather than on the surface) ensuring better efficacy and results when combined and released with specific enzymes within the skin. You can compare this technology to that of a headache tablet, which coats the active ingredient within a capsule ensuring active and effective transportation. To create more effective product stability (when combing with AHAs or AAHAs), increase active concentration and to reduce photosensitive side effects, Vitamin A derivatives are often replaced by “Retinoid –like “ ingredients such as Lana Blue (an algae) or Moth Bean / Vigna Aconitifolia (a botanical seed extract). These highly active substitutes are not as strictly governed within formulas and possess an almost equal DNA structure to that of Retinol. Found naturally in the human body and with some of the highest botanical sources from Kakadu Plum, Blackcurrants and Cranberries, Vitamin C has become one the most popular and controversial cosmeceutical ingredients in recent years. L-Ascorbic Acid, commonly referred to as Vitamin C, is recognized for its ability to protect against oxidative damage. It’s known to have photo protective effects on the skin and has shown to decrease UVB induced erythema i.e. sunburns. It is essential for the synthesis of collagen which in turn significantly improves skin texture, fine lines, wrinkles, skin laxity and decrease sallowness. It is known to have anti-inflammatory properties, thus can been used to treat a variety of inflammatory conditions. It significantly improves skin clarity via its mild tyrosinase activity, thus is used in the treatment and maintenance of several pigmentation disorders such as Melasma, PIHP and general prevention of unwanted discoloration. It’s important to fully understand the importance of vitamin C to be able to properly evaluate products and product stability. Though often unstable in its many forms and derivatives, it is evident that Vitamin C has a synergistic effect with Vitamin E, working hand in hand by protecting and repairing free-radical attacked Vitamin E antioxidants, enabling more efficient scavenging. Vitamin C however used singularly in a formulation often has its abilities questioned because of its reaction and de-generation with water. Ascorbic or L-Ascorbic Acid can fast turn into a pro-oxidant or free radical within 3-4 hours when mixed in a water based serum or solution. Likewise studies have demonstrated more effective stability in oil or lipid solutions (such as Lanolin), however again such formulas can fast oxidize, creating pro-oxidant activity within 3-4 days. Obviously the use of heavy oil based solutions restricts the type of skins it may be used on and also the depth of active Vitamin C penetration due to the larger molecular structure. Instability of vitamin C limits the forms in which it can be used to achieve effective results, thus Skinstitut’s Chirally correct L-Ascorbic Acid, is in pure powder form and does not suffer from the above mentioned limitations, providing the most effective and stable form available on the market. Perhaps the most singularly important development in cosmeceuticals in the last 10 years is the use of antioxidants within formulations. Literally ingredients that are anti-oxygen, these potent fighters defend against what is called free-radical damage, an over production of oxygen energy, resulting in cell destruction. Not only do free-radicals affect the health of the skin, but extensive medical evidence likewise implicate the role of free-radicals in the development of degenerative diseases and conditions including heart disease, Alzheimers and arthritis. Produced in normal amounts, free- radicals are chemical compounds made by the body during the metabolism of food, air exposure or sunlight to not only rid the body of harmful toxins but maintain the immune system, metabolism and collagen production. However when over-produced, these unpaired oxygen electrons create destruction, killing healthy cells and damaging DNA and surrounding tissue. The atoms try to correct this imbalance by either giving an electron to another molecule, or by taking one from another molecule, thus creating a never ending game of cellular musical chairs. Compare this process to a cut apple left sitting on a bench – the apple goes brown, or even the rust that slowly destroys a shiny piece of iron. Skins affected by excessive free-radical damage display wrinkles, pigmentation, decreased elasticity and firmness. Not only are there internal alterations to the cellular membrane affecting collagen production, but the immune fighting ability of the Langerhans cells are greatly diminished creating a tired, reactive and unbalanced complexion. It has been claimed that one of the highest creators of free-radical in the human body is the contraceptive pill, followed very closely by sun damage and smoking. Stress, pollution and drugs singularly or in combination are equally destructive, with barbequed, fried or grilled food playing a surprisingly damaging role. Consider why it is when one is most tired and stressed that you get sick? Whilst many consumers are involved with one or many of these aggressing factors, it is important to not only educate about the damage being caused, but provide both topically applied and internally taken antioxidant combination solutions to counterbalance the free-radical effects. Whilst the damage cannot be avoided, it can be minimized. Whilst there are many antioxidants on the market available, as with many ingredients it is the type and percentage that are crucial criteria for their success. Tocopheral (Vitamin E) still to this day remains not only one of the highest free-radical diffusers available, but also the most stable. This combined with other such proven fighters including Ubiquinone (Co-enzyme Q10), BHT and Ascorbic Acid (Vitamin C), provide arguably some of the strongest antioxidant cocktails available. Plant extracts including Pistachio Nut Oil and Kakadu Plum likewise are claimed to contain a higher percentage of active antioxidants than more traditional sources including Green Tea. It is well known how damaging UV radiation is on the skin. Acute and repeated sun exposure create both short and long term effects on the skin, ranging from sunburn, premature skin aging (break down of collagen, destruction of blood vessels, age spots, lines and wrinkles) to development of skin cancers. There have been many studies of the effects of radiation on the epidermis and dermis, it has been proven that small regular doses equate to chronic sun damage and is the culprit behind skin aging. Multiple short and unprotected exposures to the sun may actually become more damaging over the course of a lifetime than a smaller number of lengthy exposures resulting in sunburn. It is estimated that 90% of sun damage is the result of unplanned or casual sun exposures when people may not have active photo protection. This might include riding in a car, walking outdoors briefly or stopping to talk with friends, without a sunscreen. With better public education and sunscreens this form of damage is on the decrease. Therefore it is imperative to educate your clients on the importance of daily application of sunscreen to ensure the best possible outcome to minimise potential complications involved in dermal therapy modalities but also in prevention and maintenance of UV radiation related skin conditions. Short wave lengths of light (UVB) tend to do most of its damage in the epidermis (the outer layers of the skin), while the longer wave lengths of light (UVA) produce damage in the dermis (the inner layers containing collagen and structural elements of the skin). When the energy of these small particles of light strike a component of skin (where the light wave stops), the energy released alters the chemistry of that component and damages the component. This is the initial damage. These chemical changes also produce free radicals and these radicals continue on to cause additional damage (secondary damage) to other skin components. Unprotected sun exposure produces double levels of damage; the initial energy damage and the secondary free radical damage. You will commonly hear your clients give reasons for not using sunscreen such as “I spend much time out in the sun”, or “All sun screens cause me to break out” and “I hate the way it feels on my skin”. Now days with new nano technology, there are no more excuses. Now more than ever there are more options to the type and consistency of sunscreen formulations. Skinstitut uses the latest nanotechnology and combines the use of both physical and chemical sunscreens to give superior protection from broad spectrum light, as well as address client comfort. Skinstitut’s Perfect Protection 15+ is a light weight, sunscreen and moisturiser in one, with a comfortable and non pore clogging formulation; it is the answer to address all your clients concerns. Skin de-pigmenting agents or skin lightening agents, clinically known as Tyrosinase Inhibitors (TI’s), are commonly used to treat disorders of pigmentation such as freckles and sun spots. Multiple stimuli can influence pigmentation resulting in altered properties of the melanosomes themselves or modification of their distribution to surrounding keratinocytes, all of which are undesirable changes affecting skin color and evenness. UV radiation, hormones, medication and genetic predisposition are all contributing factors in the stimulation and development of pigment related disorders. Sunscreen, in combination with Tyrosinase Inhibitors offer protection, correction and maintenance of all such conditions. Tyrosinase Inhibitors interfere with the enzymes involved in the production of Melanin synthesis, blocking the enzyme pathway thus disabling the skins ability to produce unwanted pigment. Tyrosinase inhibitors stop the conversion of tyrosinase in to melanin thus preventing unwanted pigment production. Skinstitut’s range offers several products (Vitamin C crystals, Even Blend Serum and Perfect Protection 15+) that work synergistically together to combat unwanted pigment formation, resulting in a lighter, brighter healthier functioning skin.